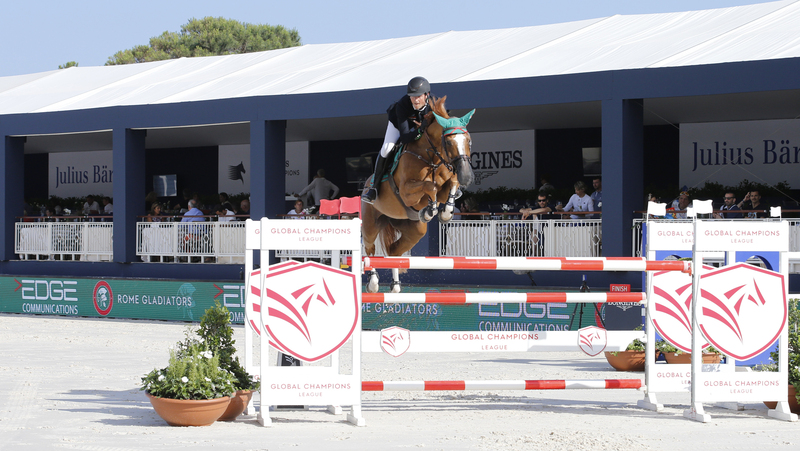 This weekend will see home city team, Rome Gladiators, take centre stage for the 15th leg of the GCL Championship race. Comprising of Laura Kraut (US), Lorenzo de Luca (ITA), Marlon Zanotelli (BRA), Abdel Saïd (EGY) and U25 rider Constant Van Paesschen (BEL), the team are within touching distance of achieving their goal of finishing in the top four and fast-tracking themselves to the semi-finals in the GC Playoffs. Powered by Edge Communications, the team is a powerful mix of experience and fresh talent, with some formidable combinations lining up already this season. With top sport going right down to the wire at each event, the team have been fighting for every valuable point, knowing one rail could make all the difference between winning and losing their place at the sharp end of the grid. And this year the battle has been turbo-charged with a brand new concept for show jumping. The new GC Playoffs in Prague in December will feature the GCL Super Cup with over €10 million in prize money, the ultimate show down in show jumping. Only 16 out of 19 teams will qualify for the GCL Super Cup after the regular season climaxes at the finals in Doha, Qatar, in November. All teams are locked in an intense race chasing points and positions to avoid the relegation zone and will be hoping to earn a place at the first indoor event ever held in the history of GCL. There is not only a huge incentive to qualify for the GC Playoffs, but also to finish the season in the top four in the GCL ranking - to fast-track to the semi finals and avoid the quarter final stage - all taking place at the O2 Arena in Prague at Christmas. So far this season the team have secured two impressive victories, at two very different arenas on the global Championship. Their first was a breathtaking win from Marlon and Constant in Monaco - the pair pulling out all the stops in one of the smallest arenas on the circuit to claim their first victory of the season and bag valuable points in their fight for supremacy. Another win from the same duo of Marlon and Constant at the most recent GCL event in Valkenswaard have put the team into third overall, and they are looking to carry that momentum through to their home event. In a sign of their successful season the team felt no need to take advantage of the mid-season transfer window, similar to soccer, and stuck with their winning roster of interchangeable horses and riders. A second place in Madrid, and a further five top ten results this season mean the team keep their place at the sharp end of the grid, just a few points away from finishing the year in prime position. Which combination will take centre stage in Rome this weekend? And will the extra pressure of performing on home turf be a boost or a downfall? One thing is for sure, the Gladiators will be looking for your support this weekend, so be sure to cheer on the green team as they fight for a home win at the beautiful Stadio dei Marmi! To learn more about the Rome Gladiators, please click here.